View the CPD Policy Working Party's response to this consultation, including proposals for outcome-based CPD and how to volunteer for our CPD pilot. 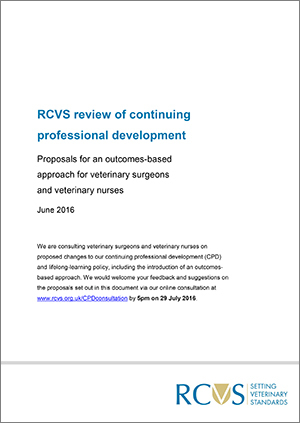 Over the last two years there have been discussions at Veterinary Nurses (VN) Council, RCVS Education Committee and RCVS Council about the longer-term direction of the College’s CPD policy and the possibility of introducing an outcomes-based approach for both veterinary surgeons and veterinary nurses. This is due to increasing evidence that the long-established and most commonly used CPD activities such as conferences, lectures and symposia, undertaken in isolation, have a limited effect on improving professional competence and performance, and no significant effect on patient health outcomes. In contrast, CPD activities which are interactive encourage reflection on practice, provide opportunities to practice skills, involve multiple exposures, help professionals identify between current performance and a standard, and are focused on outcomes, are the most effective at improving practice and patient health outcomes. The RCVS still has an ‘input-based’ system of CPD and is now ‘behind the curve’ in relation to other professions. We have therefore commissioned a review of our CPD policy and established a Working Group with a remit to consider an outcomes-based system which would bring the veterinary and veterinary nursing professions into line with current thinking about CPD. The Working Group’s proposals for an outcomes-based CPD system have been endorsed by VN Council, Education Committee and RCVS Council and are now published for consultation with the veterinary and veterinary nursing professions. Download the Working Group’s CPD proposals. This consultation will be open to the veterinary and veterinary nursing professions on 17 June 2016, closing six weeks later on 29 July 2016. Once you have read the Working Group’s proposals, please complete the consultation questionnaire online, which should take no more than 20 minutes of your time. The questionnaire has space for your name and e-mail address, but you do not need to enter these if you would rather respond anonymously. All responses should be submitted by 5pm on Friday, 29 July 2016. We are writing to veterinary and veterinary nursing organisations separately, to seek their views. All responses will be submitted to the CPD Working Group to review at its next meeting in September. The Working Group’s report will be presented to the Education Committee and VN Council in October, and the Education Committee will make final recommendations to RCVS Council in November 2016.